George Washington Esqr. 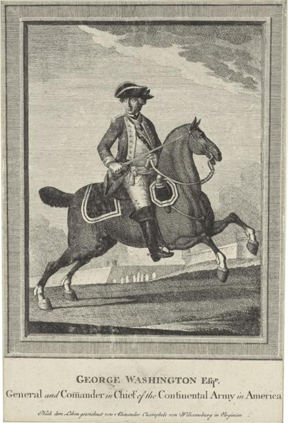 / General and Comander in Chief of the Continental Army in America / Nach dem Leben gezeichnet von Alexander Chambele von Wiliamsburg in Virginien. / Nilson fec. et excud. A. V.
Version I: As shown. Collections: American Philosophical Society; New York Public Library.